See Cohesity Cloud Edition backing up on-premises VMs directly to Microsoft Azure. CloudArchive is about providing an alternative to tape for on-premises Cohesity clusters. The backup data that was written to the cluster could then be archived to the cloud for long term data retention, as shown in Figure 1. CloudArchive supports encryption, deduplication, and compression for space efficiency. It also indexes all VM and file metadata to enable global search, and supports file-level restore directly from the archive. It is commonly used as a more efficient replacement for tape backups. 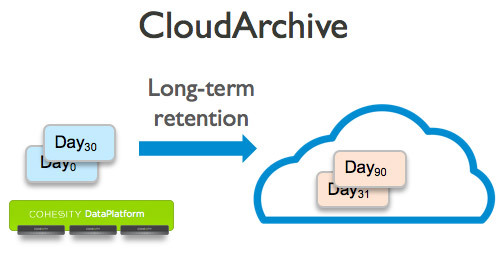 CloudArchive replicates data to the cloud for long term retention. The second use case enables customers to burst capacity to the cloud through a feature called CloudTier. Cohesity clusters have long made use of a tiered storage architecture, in which frequently accessed data (hot data) is stored on SSD storage, while less frequently accessed data (cold data) is automatically migrated onto HDD storage. CloudTier enables automatic movement of cold data to the cloud, with the ability to also move back to an on-premises storage tier. 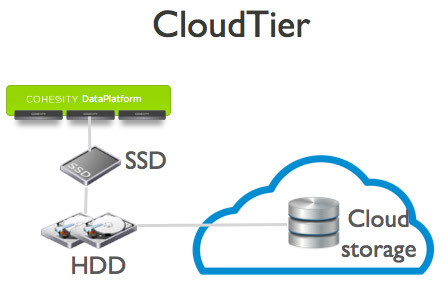 CloudTier uses cloud storage as a storage tier. The third use case enables two-way replication between a Cohesity cluster on-premises and a second one running in the Azure cloud. The introduction of Cohesity Cloud Edition was instrumental to this and provisions a Cohesity cluster in Microsoft Azure. CloudReplicate is the feature that is central to 2 way replication. With CloudReplicate data backed up on-premises is replicated to the cloud, and data that is backed up in the cloud is replicated to the on-premises Cohesity cluster. With CloudReplicate, customers can quickly bring up copies of their data in the cloud for disaster recovery, test/dev and analytics. Backup to Cloud: Cohesity is now introducing the ability to back up data directly to the Azure cloud without the need for a local Cohesity cluster. As you can see in Figure 4, a Cohesity Cloud Edition cluster is provisioned in the Azure cloud. This cluster can be used to back up applications running in Azure. But it can also be used to directly backup workloads running on-premises without the need for a local Cohesity cluster. Cohesity can back up virtual machines running on VMware and Hyper-V, physical servers, databases, and storage devices. 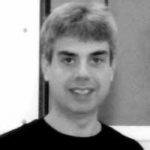 The most remarkable thing about this new solution is not really the elimination of an on-premises Cohesity cluster, but rather the cross platform support that Cohesity provides. This new solution makes it possible to back up a VMware virtual machine that is running on premises, and then run the VM in the Azure cloud, even though Azure is based on a completely different hypervisor. This means that customers can run their VMs in the cloud either for test/dev or for disaster recovery purposes, regardless of which hypervisor the VM was originally running on. That is the true power of this new solution. With this new solution Cohesity is furthering its vision for a hybrid cloud data fabric that supports multiple use cases across backup, archival, disaster recovery and test/dev.